SEOUL, Oct. 26 (Joint Press Corps-Yonhap) — The Koreas will hold general-grade military talks Friday over the enforcement of last month’s agreement aimed at reducing tensions and preventing accidental clashes, Seoul’s defense ministry said. The talks will be held at Tongilgak, a North Korean building in the truce village of Panmunjom inside the Demilitarized Zone separating the Koreas, at 10 a.m. Major Gen. Kim Do-gyun will lead the South’s delegation, while the North will be represented by Lt. Gen. An Ik-san. “Through today’s military talks, we will conduct an interim review of what we have so far implemented and discuss what we will enforce in the future,” Kim told reporters before departing for Panmunjom. “We will make our utmost efforts to play a core role in ensuring that we can facilitate the efforts for the denuclearization of the peninsula and the establishment of peace by enforcing the Sept. 19 military agreement normally,” he added. 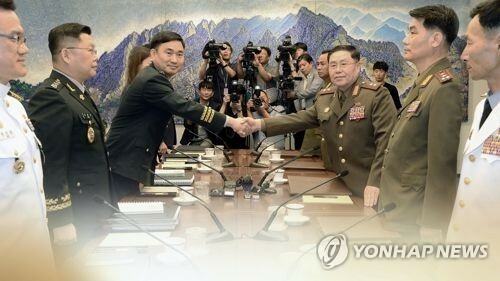 At the talks, the two sides are set to discuss how to form and operate an inter-Korean military committee tasked with enforcing the military agreement, as well as the issue of conducting joint research on the Han River estuary where civilian access has been restricted due to inter-Korean tensions. The military agreement entails a series of conventional arms control measures, such as withdrawing some border guard posts, disarming the Joint Security Area in the DMZ, and setting up air, ground and maritime buffer zones. The two Koreas’ defense chiefs signed it after the third summit between President Moon Jae-in and his North Korean counterpart Kim Jong-un in Pyongyang last month.